Have you heard? SoWa officially launched its Farmers Market App, and we're celebrating by cooking up a summer dinner. Our team prepped and planned a three course meal using only ingredients from the SoWa Farmers Market! 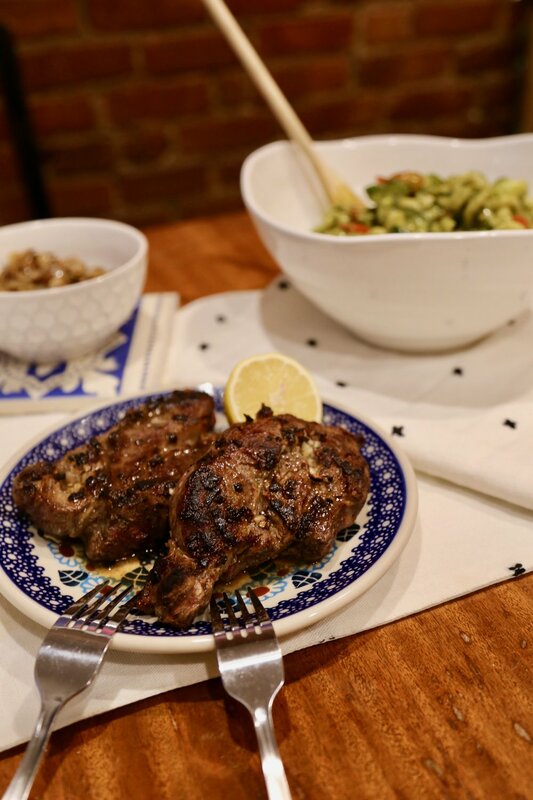 With goods from seven local vendors, we created easy summer weeknight options great for every level of culinary skill, suitable for both vegetarians and meat lovers alike! Wash and cut the squash + cherry tomatoes. Halve the tomatoes and cut the squash once vertically and then again into pieces half an inch wide. Place veggies on a rimmed baking sheet and sprinkle generously with salt and pepper. Drizzle with olive oil and toss. Spead veggies into a single layer and bake for 25 minutes, flipping halfway through. Add the pasta and cook until al dente (about 3 minutes). Drain the pasta, saving a cup of the pasta water for the sauce. Add the pasta, water, veggies + pesto to the pot and mix. Top with cheese + enjoy! Pat the steaks dry with a paper towel and sprinkle generously with salt + pepper on each side. Mince the garlic and rub on each side of the steaks. Heat a pan with butter to medium-high heat. Sear the steaks for about 3 minutes on each side. Cut the mushrooms into small pieces + chop the onions. Add a generous amount of butter to the pan. Once melted, add the mushrooms and sprinkle with salt + pepper. After the mushrooms begin to cook, add the onion. Cook until mushrooms are nicely browned and onion is soft (add olive oil as needed). Serve topped on the steak or on the side + enjoy! Older Post#MakerMonday: Black Magic Coffee Co.